Not in this case though. The opening quote is remarkably apt for a cinematic experience that evokes the spirit of Fellini or Rossellini, with the lush cinematography and social satire that has always been such a grand tradition in Italian cinema. 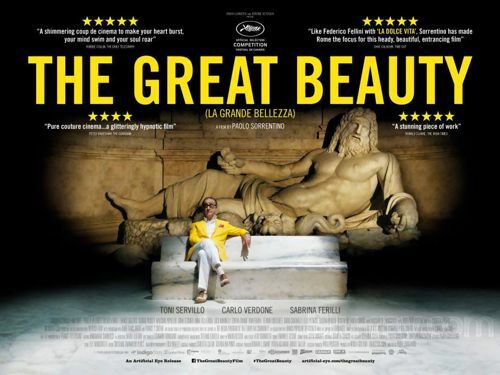 With The Great Beauty, director Paolo Sorrentino pays homage to the hidden beauty of The Eternal City, while at the same time commenting on the moral and ethical decay of a city, a people and probably society in general. Sartorial man about town, Pep Gambardella, is a sixty-something journalist and womaniser, who devotes most of his time to parties hosted by Rome’s jaded social set. The highlight of his career (and creativity) occurred 40 years before with the publishing of a seminal novel, still referenced by assorted literati and potential lovers. With the advent of his 65th birthday a sequence of events forces Pep to re-examine his life and the society within which he operates. Pep’s world is one of frivolous and vacuous parties thrown against a backdrop of classical sculptures, exclusive rooftop terraces and ancient piazzas. Parties where Rome’s artists and moneyed socialites ogle each other with haughty envy and lascivious intentions, while Pep charms everyone with witty remarks and plastic bonhomie. There are other facets to Pep though. Underneath his hedonistic exterior there is a world weary,sensitive, and even romantic man who retains enough self awareness to be able to mourn an empty existence and lost opportunities. When asked why he has not written another novel, his candid reply is that there is nothing in his life worth writing about. A back handed reference, not only to his own superficial life, but also to that of the crowd he hangs out with. As he struggles to come to terms with his existential crisis, Pep’s sardonic asides to the pretentious and self-obsessed coat hangers around him start changing into a more scathing commentary on their and his own life. Look out for the memorable scene in which Pep is accused of being a misogynist after criticising a socialite with pretensions to being a left-wing intellectual. He is quick to defend himself by replacing her accusation with an admission that he is actually a misanthrope and then proceeds to rip her self-deluded facade to shreds. When he refers to the inebriated dancing train at a party as a train to nowhere it could just as well be a political statement on a country where justice and democracy have been held hostage by the likes of Silvio Berlusconi, that epitome of the dangerous clown who keeps everyone distracted with his antics while he erodes the fabric of a just and equal society. As an example of a movie that reflects a country’s contorted soul, The Great Beauty is superlative. Beautiful scenery and an ancient heritage has not protected Italy from its slow but inevitable decline into corruption facilitated mediocrity and global irrelevance. Its elite are not portrayed as leaders, but as the decrepit and desperate hanging on for dear life, propped up by botox, money and frivolity. This is not the Rome of tourist crowds and choked public roads, but rather a trenchant and beautifully filmed perspective on the closed doors, hidden spaces and private rooms of a city and some of its people. Consummate leading man, Tony Servillo, delivers yet another mesmerising performance as the disillusioned Pep. This being the latest in a string of successful collaborations with director, Sorrentino. If you enjoyed Servillo in the award winning films, Gomorrah or Il Divo, you will definitely love him in this. Simultaneously a celebration of past glory and a eulogy for lost opportunities, The Great Beauty is a smörgåsbord of cinematic delight. an admirable & thorough review, thank you! Thank you Brigitte. We aim to please. Hope you enjoyed the film, if you have seen it.